Today I wanted to share with you another creation to finish off the Your Next Stamp 5 year birthday celebration! 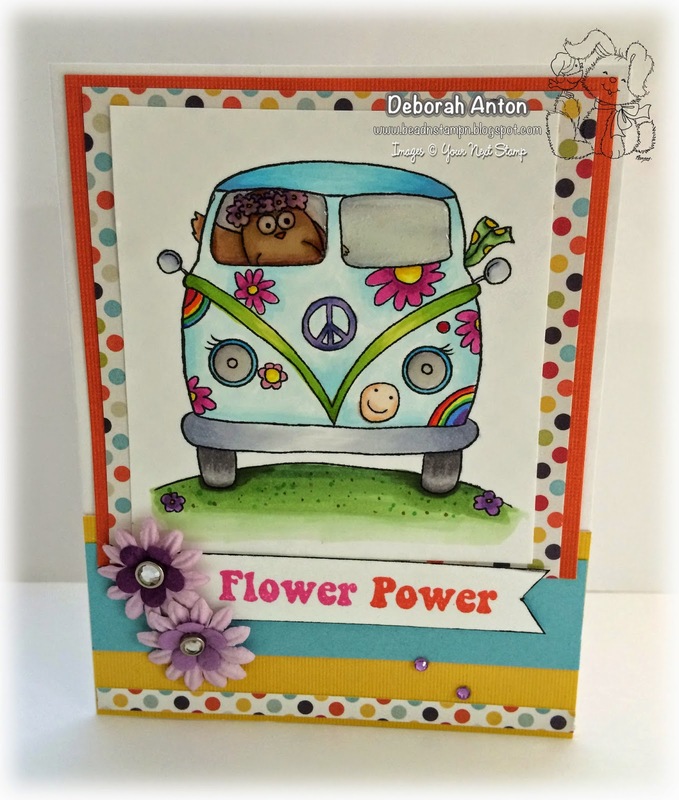 Using Hippie Owl and the current YNS Sketch, I created this fun card to showcase this ever-so-cute image. For the windows and headlights, I used some Glossy Accents to add a fun element to the image. The image was colored in using Copics and the patterned paper is from Echo Parks That's My Boy collection. Here is the current sketch which you still have time to play along, link up, and possibly win and the close up of the glossy bits. 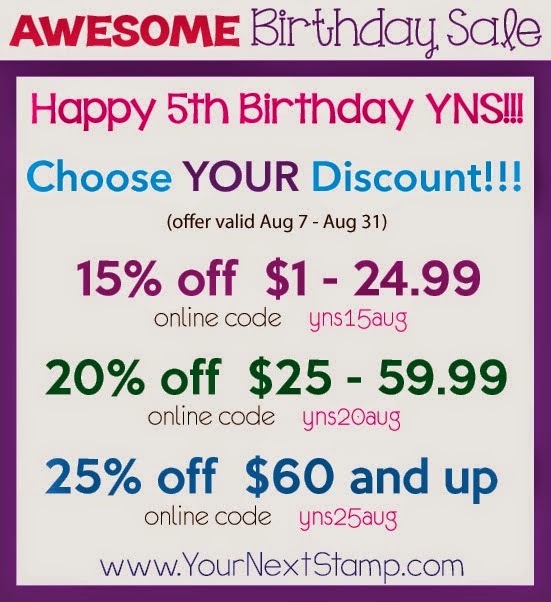 And speaking of time, you also still have time to save some money at Your Next Stamp with the Awesome Birthday Sale still going on. Be sure to check it out and get some of these super fun images and accessories! Hello everyone! I hope you all are ready for the weekend relaxing, catching up on things, or even just crafting! 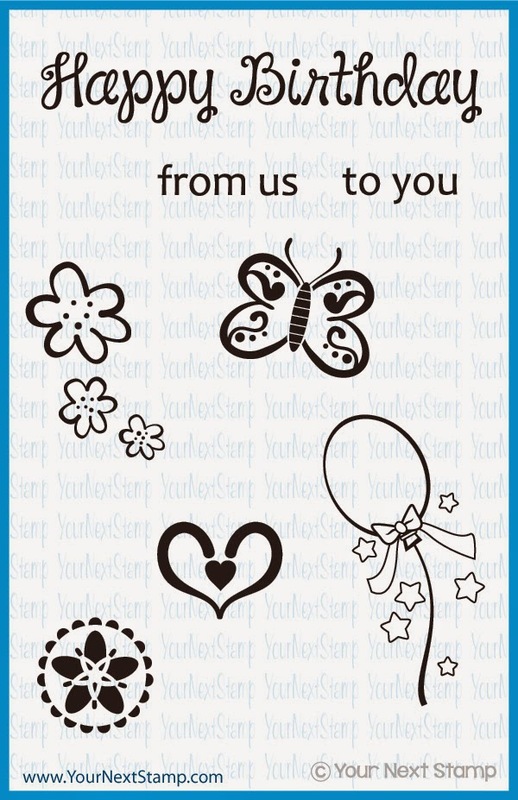 Today is Friday and one to share another Your Next Stamp Friday Fun Project. I am using the ever cute image of Little Sailor Girl, some new YNS dies, and some fun coordinating papers. The image was colored in with Copics using the current YNS sketch on the challenge blog. The papers are Carta Bella's Ahoy There finished with some fun NEW YNS dies of Scripty Words and 3D Banner set. So super fun! For some added features, I completed the look with some rope style ribbon and an anchor die cut. The image and banner are popped up for some dimension. Thanks for stopping in and taking a looksy! I do hope you stop by the YNS blog to check out the other fab projects from the DT. Have a great weekend! I hope your week has gone by splendidly and now ready to enjoy the weekend!! I have a darling image to share with you today from Flat Friends Boutique using Friday Sketch Challenge's #74 sketch. If you haven't checked out these images, you should! They are so cute, modern, and fresh. 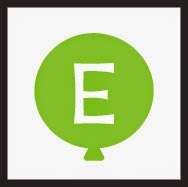 This image is called LOL and I chose it because it reminds me of my two boys. They keep in close contact with their friends and seem to always be chatting or texting. The image was printed on X-press it paper and colored in with Copics. The patterned paper is from Echo Parks That's my boy collection while the sentiment is from Lawn Fawn's #awesome set. 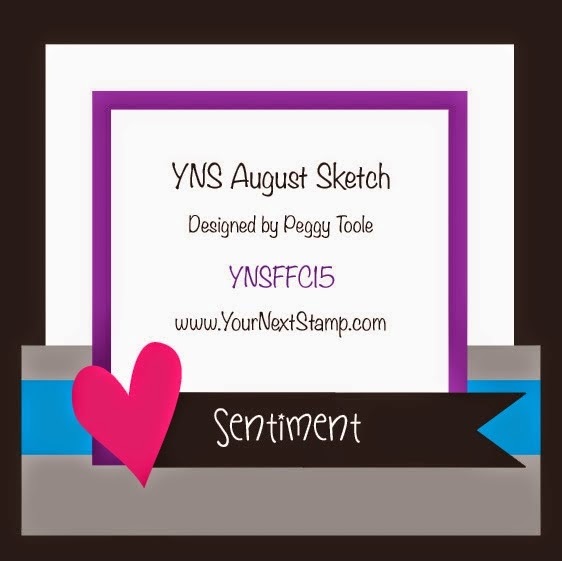 Be sure to come check out the newest sketch challenge and enter your creation to win from our current sponsor. Thanks for popping in and taking a peek! Have a great weekend! The hop begins on Bonnie’s blog and if you've been hopping along, you should have come from Jen's blog. Make sure you hop around to all of the blogs featured in the link list located at the bottom of this post for lots of inspiration using the new products! For my card, I am using Hippie Owl. I just can't get over this adorable image! I love the VW bus and it reminds me of my childhood when our neighbor drove one and we always knew who it was when it was driving around town. This image was stamped on X-Press It paper and colored in with Copics. 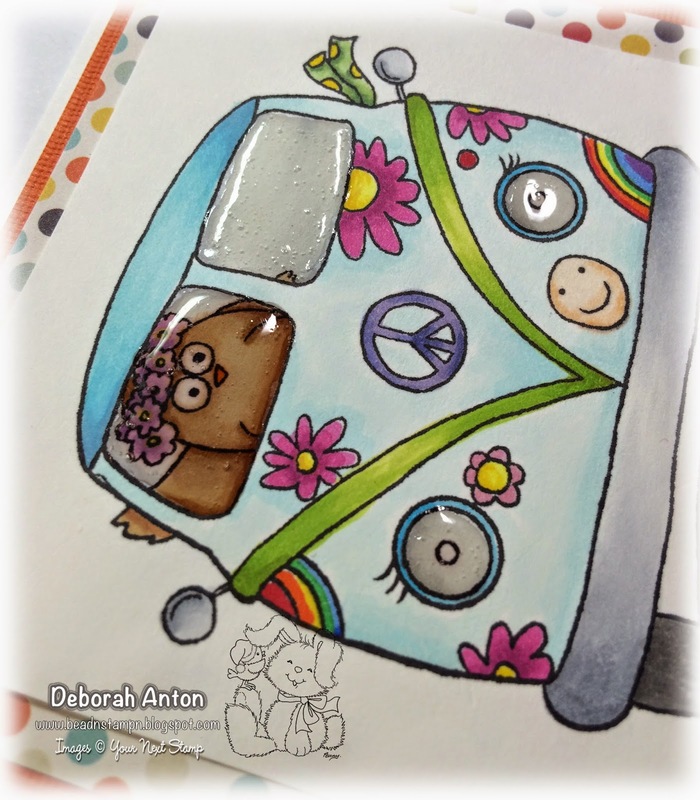 I followed the current sketch over at the YNS challenge blog and used some fun tie dye patterned paper for the background. Included is the new YNS banner die which I used for the sentiment. The card was finished with some Prima flowers and some YNS Gumdrops. Now it's time to head on over to Peggy's blog, but before you go, don't forget to leave a comment and collect your balloon letter. I hope your week has been great and you are ready for a great weekend. I know I am ready for it - we have completely moved into our new home, more importantly, my craft room is DONE, (whoo hoo!!) and the best part is that I get to see my very good friend, Carolyn (Cammie). I am very excited about that! It's been too long since I have seen her. Today's Your Next Stamp Friday Fun Project is featuring Gretchen with Jolly. This image really is so adorable and I know many people who can relate with it. The image was printed on some Neenah cardstock and colored with Copics before fussy cutting it to be popped up on the center circle layer. The patterned paper is Basic Grey, while the sentiment is from YNS Tobi with a rose clear set. I completed the look with some ribbon, twine, and a button. That's it for me today, but now that I have a completed craft room, I can't wait to get back to creating! 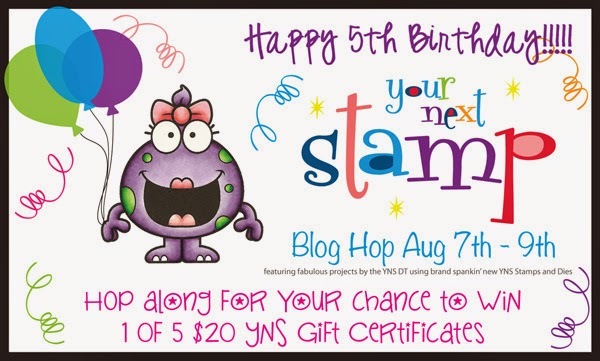 Be sure to check out the other YNS Fun Project from the DT and leave a little love! Have a great weekend!